[New for 2017] I realized that I forgot to actually try any of the treat versions of the new Hostess ice creams this year... ofcourse, the ice creams say "Limited Edition" but the treats do not. As (bad) luck would have it, my first sampling was cracked at the top because there is a weak point where the coating isn't thick enough where the filling meets the... wafers I guess we will call them. No matter though, the split doesn't affect the taste, it just makes it a little riskier to eat. I dig in and it's a decent treat. Nothing terribly remarkable, but nothing crazy bad either. 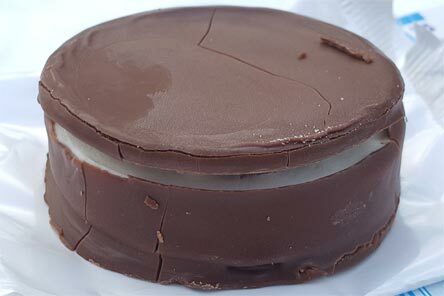 If I had to clarify that, I would say that no particular ingredient (filling, wafer, and shell) brings enough pizzazz to make this a must try treat. If the filling had been more robust and the shell thicker, this would have had the potential for a repeat purchase for me. Since these are only 180 calories a piece, I had a second one later on in the day (notice the top is still attached on this one). Now there is something I want to ask because I haven't had a ring ding or ding dong or whatever in a really long time. In this particular setup, the wafers have a hint of coffee like flavoring to them. It's this odd (cheap?) cocoa flavoring to the wafers that permeates every bite. It's not terrible, but it is definitely there. What I want here is more milk chocolate flavor and less random cocoa flavor. What else? The overall texture is decent. It's definitely different so I want to give that props, but like I said, the ratios seems a bit off. 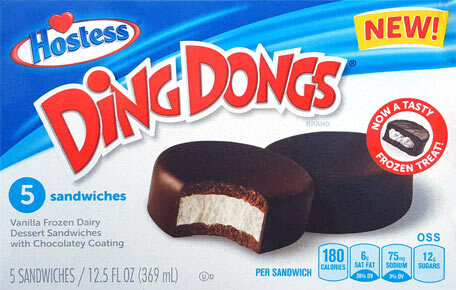 I guess I'm comparing it to a true ding dong where the filling is suppose to add a nice creamy pop to the treat. This is going for that, but doesn't quite make it. Since these have been out for awhile, who else has tried them? I noticed that same sort of coffee flavor when eating a chocolate wafer from dollar tree. Maybe cheapness is a factor? But uh, neither Ding Songs nor Ring Songs have any milk chocolate whatsoever, so I don't think that would've been appropriate. 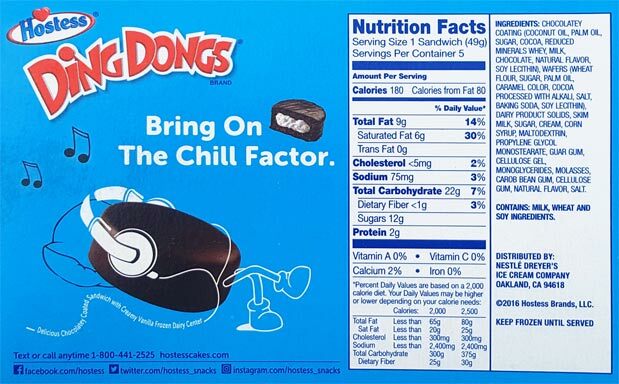 I eat Ding Dongs semiregularly and I tried these things and I wasn't impressed and didn't buy again. I found the coating too thick, and unlike the chocolate on a Ding Dong and the ice cream itself tasted bland.